Six-year-old Alex Martin lost his mother when he was just a year old. His father was too ill to care for him, and so he was taken in by his grandmother. She died a year later. Since then, Alex has lived at the Mission to Homeless Children, in Morogoro, Tanzania, an indigenous Christian orphanage that is assisted each month through the child-sponsorship program of our Orphan’s Tear division. Alex is a happy, well-adjusted little guy who loves Jesus, because of the Christian nurture he receives at the orphanage. Other orphaned children in Morogoro—of which there are thousands whose parents have died from AIDS—aren’t as fortunate as Alex. They live on the streets and scavenge for survival. The director of Mission to Homeless Children, Robert Simba, has a heart for them all. 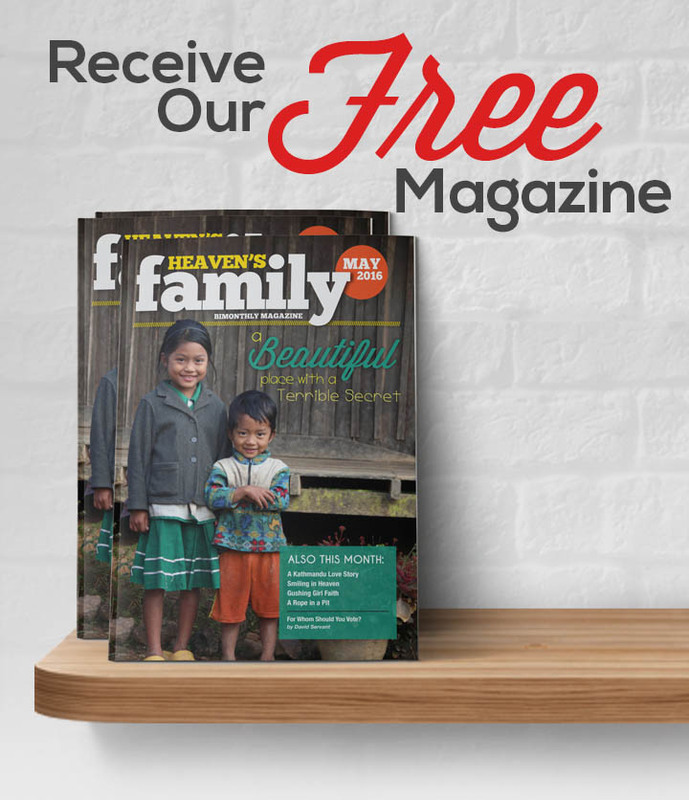 Heaven’s Family has helped him purchase land and complete a beautiful new building that has a capacity for at least sixty children, and probably more. Once we’ve provided a well, the children will move in. 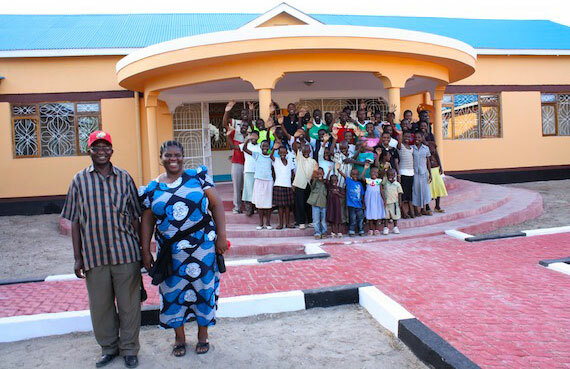 Director Robert Simba with his wife, Veronica, and most of the orphans of Mission to Homeless Children in Morogoro, Tanzania. They are standing in front of their brand new building, funded by Heaven’s Family. That was in March of 2007. By faith, Simba and his crew started clearing the five acres we had purchased for them in 2006. We produced a video to raise funds. As funds came in over the months to our Orphan’s Tear Special Gifts Fund and Dorms for Orphanages Fund, we sent construction money (as we also did and still do for many other Christian orphanages around the world). Simba started sending regular accountings and photos of the construction progress. In the end, God provided a total of $141,000 that included the cost of five acres. When my wife, Becky, and I visited the new building one evening in February during a trip to Tanzania, we were amazed at what had been built for $141,000. It would have cost at least three times as much in the U.S., and it was beautiful. It has a capacity for more than sixty children. Mission to Homeless Children currently houses about forty, but there are thousands of orphans living in Morogoro, mostly due to AIDS. And the new building is significantly superior to their former dilapidated, rented facility. Along with all the children, we walked inside their soon-to-be-used, but empty, dining hall. As the voices of forty beautiful orphans echoed off the walls—singing of God’s faithfulness in perfect African harmony—it was hard to hold back our tears. Surely, I thought to myself, the same God who had already provided $141,000 would provide what these children still needed for beds, other furniture, plus a well for drinking water and crop irrigation. Great is His faithfulness. To view a three-minute video that tells the story of Mission to Homeless Children, click here. The Bigger Picture: Contributions to the Orphan’s Tear Special Gifts Fund and the Dorms for Orphanages Fund have so far made possible the construction of twenty-six quality-built orphanage buildings, all of which are now homes for Orphan’s Tear-sponsored children. A child sponsorship of $20 per month helps provide food, clothing, shelter, school fees and Christian nurture for a child whom you select at OrphansTear.org. 100% of your monthly sponsorship gift is sent to the orphanage where your child lives. Currently, only twenty-four of Mission to Homeless Children’s forty-four orphans are sponsored, and the orphanage is struggling for daily needs. (Blurred for security purposes) K.P. George, his wife Samari, their son and “adopted” children. This photo was taken by HF staff before K.P. was brutally beaten because of false allegations against him. Indian pastor K.P. George was shoved into a back room of the local police station where he was accused, slapped, and then brutally beaten. His crime? A complaint had been filed that accused him of abusing a teenage girl named Virishna. Virishna was born in a remote tribal area of India, and she is one of ten orphan/unwanted girls that K.P. and his wife, Sarami, have compassionately taken into their own home. For years they have cared for her like their own daughter. All ten girls are supported each month through Heaven’s Family’s Orphan’s Tear division—because of the kindness of child sponsors. Eight years ago, K.P. was directed by the Lord to relocate to his wife’s home village to plant a church among the H****s there. They met with much resistance, but through perseverance, K.P. and Sarami succeeded to win some of Sarami’s H**** family members to the Lord. The blood of martyrs, however, was the seed of the church. Samari’s sister, mother and father all paid for their new faith with their lives. Sarami’s father was the last of the three to be murdered. K.P. and Sarami found him lying dead in their home, his body wrapped in a cloth banner bearing the color and markings used by the local H**** militants. A note on the body addressed to K.P. read, “If you want to live, leave this place, or get ready to die.” K.P. and Sarami stayed, clinging to a prophecy they had received when God first sent them: “You will have to face death face-to-face, but if you stay, I will honor you.” So far, God has honored them with sixty-two H**** converts and ten “daughters,” all orphans or unwanted children, that is, until K.P. and Sarami welcomed and loved them. K.P. has also planted a number of churches in three other villages. This has enraged local H**** fanatics. In January, Virishna was waiting at a bus stop after classes for her ride home. One of her H**** teachers lured her into his car, promising to take her to her home. Instead, he took her to his own house and questioned her at length regarding K.P. and Sarami, and questioned where they got their money to take care of the ten girls. When Virishna was a half-hour late returning home, K.P. called the school. School officials told him that she did not want to return to the orphanage and that she was being kept in a safe place. As K.P. continued his search for truth the following day, two policemen came to his house and asked him to join them at the police station. There he was accused, threatened, and tortured. It was nothing more than a plot to shut down his ministry. K.P. had been so abused during his jail stay that he spent a month in the hospital afterwards. His medical bills climbed to $1,500, far beyond his means. He has also incurred $1,000 in attorney fees to defend himself against the false accusations that have been filed against him. Heaven’s Family has been privileged to pay all these expenses for him by means of gifts to our Persecuted Christians Fund. A medical examination of all ten girls was conducted that will verify K.P.’s innocence at his trial. Please pray that justice will be served and that God will be glorified. The Bigger Picture: This is not the first case of false charges being filed against pastors who direct small orphanages that we assist in India. Although we have been able to help pastor K.P., we need continued support to help others like him, who stand firm in their faith for the sake of the gospel. Your gifts to the Persecuted Christians Fund express Jesus’ love for His persecuted body all over the world. When I visited Lahore, Pakistan in December of 2008, I stayed for several days in the home of pastor Augustine Joseph, who had been helping Heaven’s Family print and distribute the Urdu translation of The Disciple-Making Minister to Pakistani Christian leaders. While there I learned that many poor believers in Pakistan have no choice but to drink unsafe water. So, in mid-2009, when the Sawyer water filter became available as a simple, safe-water solution, we shipped one-hundred of them to Augustine. Meraj Masih is a middle-aged and very poor believer, and he lives with his nine family members in Rasool Park near Lahore. This town is missing all the basic necessities: clean water, sewerage system, health center, and play ground. The people are living below the poverty level. Children play in dirt and garbage and often get sick. Meraj is working as a watchman on a very low salary for a primary school in the same town. He told us that he is not able to send any of his children to school because of his low income, and that most of the time his children suffer from different sicknesses. Stomach infection is one of the main problems for them, and he used to spend a lot of money on their medical treatment every month. The Bigger Picture: Every $40 donated to Heaven’s Family’s Safe Water Fund provides one Sawyer water filter and a bucket. Each filter can provide daily safe water—free from bacteria and parasites—for one-hundred people. Heaven’s Family has already distributed more than 800 Sawyer water filters to poor believers in nine different nations: Burundi, Dominican Republic, D.R. Congo, Haiti, India, Kenya, Pakistan, Peru, and Rwanda. That amounts to safe water for 90,000 of the “least of these” among the family of Jesus, who will one day say to His true sheep, “I was thirsty, and you gave me something to drink” (Matt. 25:35). Twin brothers Lal Nun and Lal Mal in their rice field. They are just a few of the many children who are blessed to live at Mercy Children’s Home. As a little boy, God’s mercy upon Ro Lian was unmistakable. Although materially poor like most Burmese children, he was privileged to have parents who were Christians — a rare blessing in Myanmar. Divorce and drug addiction destroy many Burmese families who live in darkness, but Ro’s parents served God and loved and cared for him. Ro was also blessed to have parents who loved Jesus so much that they served God as missionaries, traveling to other villages to reach their Buddhist neighbors with the gospel. Not everyone welcomed the good news that Ro’s parents shared, and the family faced the persecution that Jesus promised to all those who serve Him. Yet Ro’s mother and father endured, even in the face of severe opposition, loving Jesus more than their own lives. One day they didn’t come home. They paid the ultimate price for their faith, and little Ro found himself an orphan. Tragically, many orphans in Burma end up on the streets fighting for survival or in Buddhist monasteries to be raised as monks. Yet when Ro needed it more than ever, God’s mercy was there to embrace him once again. A Christian woman named Rin Sang Puii came to his rescue. She brought him to her home where she cared for quite a few other orphaned and unwanted children. There was a sign on the fence that read, Mercy Children’s Home. There, little Ro experienced God’s love, not only because of Rin Sang Puii, but because of many caring people in the West who sponsor the children who live there through Orphan’s Tear, a division of Heaven’s Family. Ro could now attend school, receive Christian nurture, and be well-clothed and fed. Recently, God has once more poured out His mercy upon Ro, now ten years old, and his adoptive family. Because of gifts to the Rice Fields for Orphanages Fund, Mercy Children’s Home has just purchased six acres of rice paddies. Now Ro’s daily needs — along with thirty other children — are better supplied than ever. The Bigger Picture: The price of rice has more than doubled in the past ten years. That is why Heaven’s Family established the Rice Fields for Orphanages Fund. By purchasing rice fields for our orphanages, we are able to protect them from cost increases and supply fluctuations, and enable them to be more self-sufficient. To date, 17 of the 51 orphanages we support have received their own rice fields. Only the sound of fingernails scraping down a chalkboard is more grating to the ears than the high-pitched cacophony of twelve treadle sewing machines rattling out of unison. At the Kalaymyo Sewing School (KSS), yesterday’s news rips and glides through pumping needles as novice seamstresses struggle to sew straight seams using not fabric, but old newspapers. What began as a Heaven’s Family-funded sewing school for older orphans has now expanded to provide vital vocational training for other young women in the city of Kalaymyo, Myanmar. We started two years ago by purchasing twelve treadle sewing machines and paying a teacher’s salary for a year. Older girls, from the many orphanages that we assist around Kalaymyo, immediately began to benefit from the classes. But their regular school classes restricted their sewing lessons to nights and Saturdays. So the sewing school opened daytime doors to non-orphan girls in the community. Now, girls from poor families are also being equipped with a skill that will help them provide for themselves for the rest of their lives. In a community where most can only afford life’s absolute necessities, an individual with the ability to make clothing is one who will never be without employment. Sitting behind one of the sewing machines at KSS is a young woman by the name of Van Bawi. She lives at home with her parents and four sisters. “Home” is a small room lent to them by friends. Van Bawi’s father is an evangelist who has no regular income. Each month he must trust God to provide what his family needs to survive. When Van Bawi heard about our sewing school she knew that it would be a wonderful opportunity to help provide for her struggling family. It was with great joy that she learned she had been accepted as a student. The school starts a new class every three months, but to become a tailor, girls must attend for four quarters. Van Bawi attends the sewing school full-time five days a week. She is well on her way to fulfilling her dream of becoming a professional tailor and relieving some of the financial stress on her family. KSS has been operating on a shoestring budget. For the past year there hasn’t been money for fabric on which the students could practice, and so old newspaper had been employed as a substitute. When we learned of their need, we provided funds for all the fabric they needed, plus two additional sewing machines so that the school could accommodate a few more students. These blessings are a result of gifts to the Educational Fund. Thanks so much. The Bigger Picture: What was previously the Older Orphans’ Educational Fund has, out of need, broadened to now become the Educational Fund. From this fund, we are not only helping older orphans gain vocational skills, but paying school fees for the children of impoverished widows and assisting indigenous Christian schools. Gaining vocational skills or an education is a ticket out of the grinding poverty that is a daily reality for millions of our spiritual family members in the developing world.